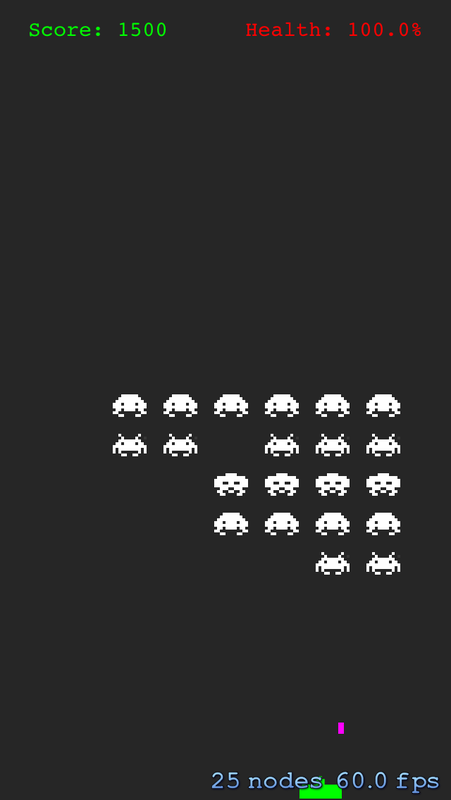 Learn how to make a game like Space Invaders in this 2-part Sprite Kit tutorial! Note from Ray: This is a brand new Sprite Kit tutorial released as part of the iOS 7 Feast. Enjoy! 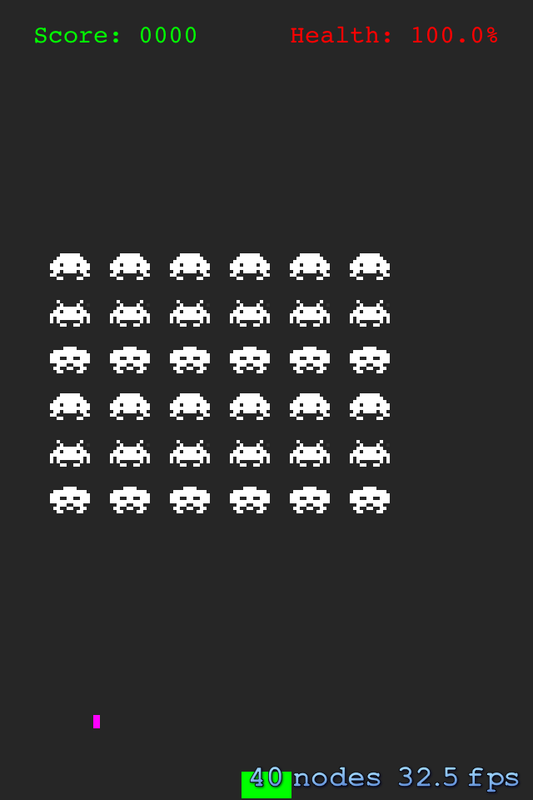 Welcome back to our 2-part Sprite Kit tutorial that teaches you how to make a game like Space Invaders! In the first part, you created the foundation of the game. So far, you’ve added the invaders, your ship, and a Heads Up Display (HUD) to your game. 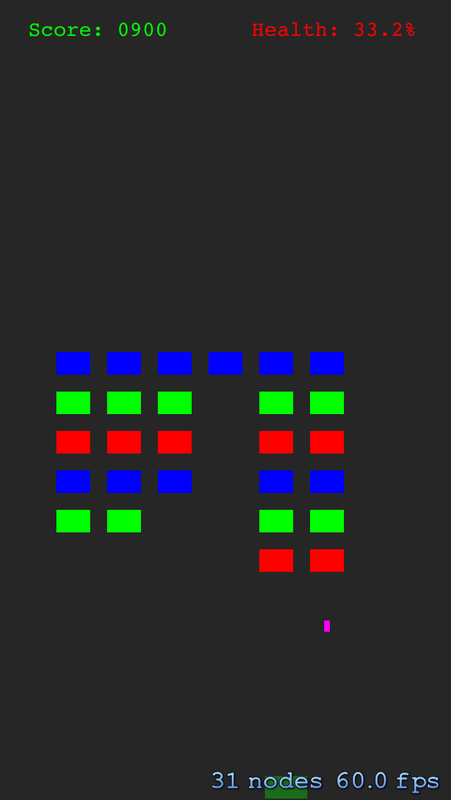 You also coded the logic to make the invaders move automatically and to make your ship move as you tilted your device. In this second and final part, you’ll add the ability for your ship and the aliens to fire on each other and blow each other up! You’ll also polish your game by adding sound effects and realistic images to replace the colored rectangles that currently serve as place holders for the invaders and your ship. This tutorial picks up where the first part left off. If you don’t have the project already, you can download the example project where we left things off. All right, it’s time to blow up some invaders! First, think about how you want your scene to fire the ship’s laser cannon. You decided to use single-taps to fire the cannon. But how should you detect these single taps? UITapGestureRecognizer – Create one and attach it to your scene’s view. touchesEnded:withEvent: – Your scene is a subclass of UIResponder; therefore, you could use this to detect touches directly. The second approach is the best choice in this situation: touchesEnded:withEvent:. The first approach gets a bit tricky when you need to detect and handle touches differently in the various scene nodes of your game, since you can only specify a single callback selector for the UITapGestureRecognizer on the scene’s view. The extra work to get this working properly just isn’t worth it in this simple case. Since all SKNode nodes (including SKScene) can handle touches directly via touchesEnded:withEvent:, the second choice is a much more natural approach to handling node-specific touches — and will pay off when you develop games with more complex tap handling. Now that you’re going to detect user taps in your scene’s touchesEnded:withEvent: method, what should you do inside that method? Taps can happen at any point during the gameplay. Contrast that with the way your scene changes: — at discrete intervals from within the update: method. 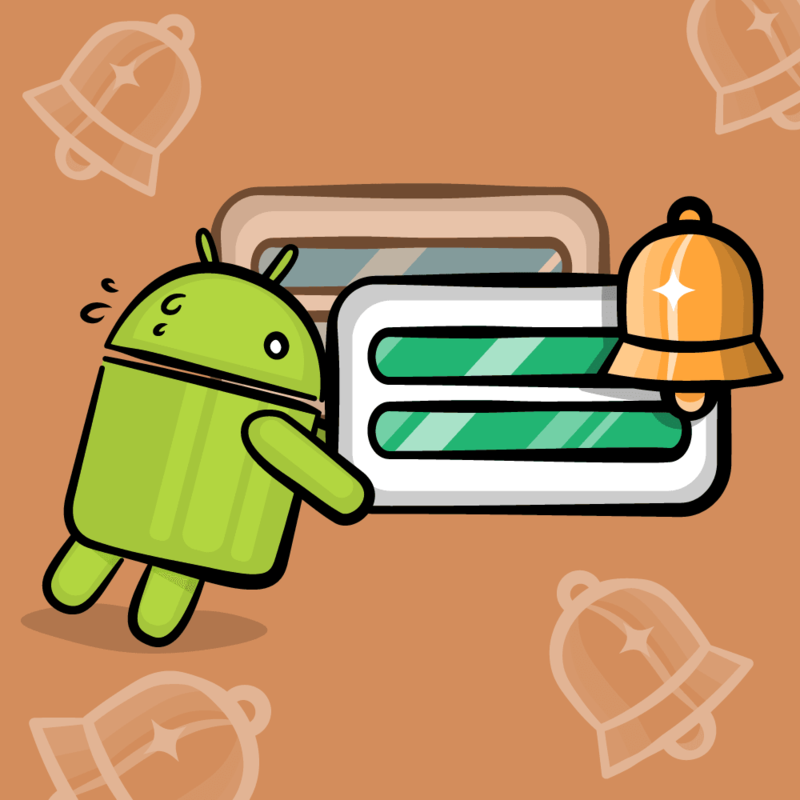 So how can you save up taps detected at any time in touchesEnded:withEvent: and process them later in update: when it’s invoked by the Sprite Kit game loop? The answer is a queue! You’re going to use a simple NSMutableArray to store your taps in a FIFO (First In First Out) queue. The above code initializes the tap queue to an empty array and ensures that user interactions are enabled for the scene so it can receive tap events. The first three methods are just empty stubs; they’re added because Apple suggests doing so when you override touchesEnded:withEvent: without calling super. The touchesEnded:withEvent: method itself is fairly simple. It just adds an entry to the queue. You don’t need a custom class to store the tap in the queue since all you need to know is that a tap occurred. Therefore, you can use any old object. Here, you use the integer 1 as a mnemonic for single tap (@1 is the new object-literal syntax that converts the literal 1 into an NSNumber object). This method is relatively straightforward: it simply creates a rectangular colored sprite to represent a bullet and sets the name of the bullet so you can find it later in your scene. Create an SKAction that moves the bullet to the desired destination and then removes it from the scene. This sequence executes the individual actions consecutively — the next action only takes place after the previous action has completed. Hence the bullet is removed from the scene only after it has been moved. Play the desired sound to signal that the bullet was fired. All sounds are included in the starter project and iOS knows how to find and load them. Move the bullet and play the sound at the same time by putting them in the same group. A group runs its actions in parallel, not sequentially. Fire the bullet by adding it to the scene. This makes it appear onscreen and starts the actions. Only fire a bullet if there isn’t one currently on-screen. It’s a laser cannon, not a laser machine gun — it takes time to reload! Set the bullet’s position so that it comes out of the top of the ship. Set the bullet’s destination to be just off the top of the screen. Since the x coordinate is the same as that of the bullet’s position, the bullet will fly straight up. The decision in //1 to only allow one ship bullet on-screen at the same time is a gameplay decision, not a technical necessity. 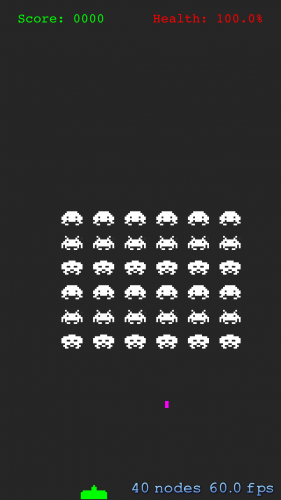 If your ship can fire thousands of bullets per minute, Space Invaders would be too easy. Part of the fun of your game is choosing your shots wisely and timing them to collide with invaders. Your laser cannon is almost ready to fire! Loop over a copy of your tapQueue; it must be a copy because it’s possible that you’ll modify the original tapQueue while this code is running, and modifying an array while looping over it is a big no-no. If the queue entry is a single-tap, handle it. As the developer, you clearly know that you only handle single taps for now, but it’s best to be defensive against the possibility of double-taps (or other actions) later. Remove the tap from the queue. Note: processUserTapsForUpdate: completely consumes the queue of taps at each invocation. Combined with the fact that fireShipBullets will not fire another bullet if one is already onscreen, this emptying of the queue means that extra or rapid-fire taps will be ignored. Only the first tap needed to fire a bullet will matter. This invokes processUserTapsForUpdate: during the update loop and processes any user taps. Build your game, run, and tap away! Awesome, your ship can finally fire on those evil invaders! You’ll have them on the run soon enough. But you’ve probably noticed that your bullets pass straight through invaders instead of blowing them up. That’s because your bullets aren’t yet smart enough to detect when they’ve hit an invader. You’re going to fix that in a moment. Only fire a bullet if one’s not already on-screen. Collect all the invaders currently on-screen. Select an invader at random. Create a bullet and fire it from just below the selected invader. The bullet should travel straight down and move just off the bottom of the screen. Fire off the invader’s bullet. This invocation of fireInvaderBulletsForUpdate: starts the invaders firing back at you. 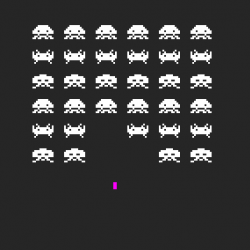 As a matter of game design, notice that the invaders’ bullets are purple while your ship’s bullets are green. This strong color contrast makes it easy to see the difference between bullets in the heat of battle. Also, you should hear a different sound when your ship fires versus when an invader fires. The use of different sounds is partly stylistic, to give your game rich audio and make it more immersive. But it’s also partly an accessibility issue since 7 – 10% of men and 0.5% – 1% women are color blind. The differentiation in sound effects will make your game more playable by those who are color blind. With all those bullets flying around on the screen it’s amazing that nothing blows up! That’s because your game has no hit detection. It needs to detect when your ship’s bullets hit an invader — and when an invader’s bullet hits your ship. You could do this manually, comparing bullet/invader/ship positions at each update: invocation and checking for hits. But why not let Sprite Kit do the work for you? Since you’re already using physics bodies, Sprite Kit’s physics engine can detect when one body hits another. For this, you’ll use contact detection — not collision detection. You’re not using physics to move bullets or invaders, so you’re not interested in the physical collisions between them. Contact detection merely detects when one physics body overlaps another in space; it doesn’t otherwise move or affect the bodies in contact. Some games have many distinct types of physics bodies and are not interested in contact between all types of physics bodies. Sprite Kit will only check for contact between those categories of physics bodies that you tell it to check. This is both a speed optimization and a correctness constraint, as some types of contact may not be desired. Controlling which physics bodies are checked for contact begins by defining category bitmasks. These strange-looking constants are bitmasks. A bitmask is basically a way of stuffing multiple on/off variables into a single 32-bit unsigned integer. A bitmask can have 32 distinct values when stored as a u_int32_t. Each of these five categories defines a type of physics body. Notice how the number to the right of the << operator is different in each case; that guarantees each bitmask is unique and distinguishable from the others. This new code sets the category for the physics body of your scene. Don't detect contact between the ship and other physics bodies. Do detect collisions between the ship and the scene's outer edges. Note:You didn't need to set the ship's collisionBitMask before because only your ship and the scene had physics bodies. The default collisionBitMask of "all" was sufficient in that case. Since you'll be adding physics bodies to invaders next, setting your ship's collisionBitMask precisely ensures that your ship will only collide with the sides of the scene and won't also collide with invaders. While you're at it, you should set the category for the invaders since this will help detect collisions between your ship's bullets and the invaders. This code gives your invader a physics body and identifies it as an invader using kInvaderCategory. It also indicates that you don't want invaders to contact or collide with other entities. Your next step is to categorize bullets and set their contact and collision masks. The above code identifies ship-fired bullets as such and tells Sprite Kit to check for contact between ship-fired bullets and invaders, but that collisions should be ignored. That takes care of the ship's bullets — now on to the invaders' bullets! This code is similar to the previous block: it identifies invader-fired bullets as such and tells Sprite Kit to check for contact between invader-fired bullets and your ship, and again, ignores the collision aspect. Note: In order for contact detection to work, the ship-fired bullets must be defined as dynamic by setting bullet.physicsBody.dynamic = YES. If not, Sprite Kit won't check for contact between these bullets and the static invaders as their definition is invader.physicsBody.dynamic = NO. Invaders are static because they aren't moved by the physics engine. Sprite Kit won't check for contact between two static bodies, so if you need to check for contact between two categories of physics bodies, at least one of the categories must have a dynamic physics body. You may be wondering why the contactTestBitMask values are not symmetrical. For example, why are you setting an invader's contactTestBitMastk = 0x0 but a ship-fired bullet's contactTestBitMask = kInvaderCategory? The reason is that when Sprite Kit checks for contact between any two physics bodies A and B, only one of the bodies needs to declare that it should test for contact with the other, not both. As long as either A declares that it can contact with B, or B declares that it can contact with A, contact will be detected. It's not necessary for both bodies to declare that they should test for contact with the other. Setting the contactTestBitMask on only one type of body like you've done seems more manageable. You might prefer to set contactTestBitMask values on both types of bodies, and that's fine, as long as you're consistent in choosing one approach or the other. With these changes, your game's physics engine will detect contact between ship-fired bullets and the invaders, and between invader-fired bullets and your ship. But how does the physics engine inform your game of these contacts? The answer is to use SKPhysicsContactDelegate. This declares your scene as a delegate for the physics engine. The didBeginContact: method of SKPhysicsContactDelegate executes each time two physics bodies make contact, based on how you set your physics bodies' categoryBitMask and contactTestBitMask. You'll implement didBeginContact: in just a moment. Much like taps, contact can happen at any time. Consequently, didBeginContact: can execute at any time. But in keeping with your discrete time ticks, you should only process contact during those ticks when update: is called. So, just like taps, you'll create a queue to store contacts until they can be processed via update:. This just initializes an empty contact queue and sets the scene as the contact delegate of the physics engine. This method simply records the contact in your contact queue to handle later when update: executes. Don't allow the same contact twice. If an invader bullet hits your ship, remove your ship and the bullet from the scene and play a sound. If a ship bullet hits an invader, remove the invader and the bullet from the scene and play a different sound. The above just drains the contact queue, calling handleContact: for each contact in the queue. 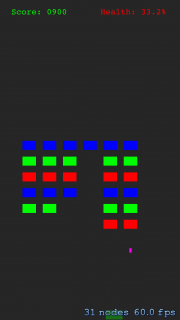 Build and run you app, and start firing at those invaders! Now, when your ship's bullet hits an invader, the invader disappears from the scene and an explosion sound plays. In contrast, when an invader's bullet hits your ship, the code removes your ship from the scene and a different explosion sound plays. Depending on your playing skill (or lack thereof! ), you may have to run a few times to see both invaders and your ship get destroyed. Just hit Command R to run again. Your game looks good, but it's lacking a certain something. There's not much dramatic tension to your game. What's the advantage of hitting an invader with your bullet if you don't get credit? What's the downside to being hit by an invader's bullet if there's no penalty? You'll rectify this by awarding score points for hitting invaders with your ship's bullets, and by reducing your ship's health when it gets hit by an invader's bullet. Your ship's health starts at 100% but you will store it as a number ranging from 0 to 1. The above sets your ship's initial health. The new line sets the initial HUD text based on your ship's actual health value instead of a static value of 100. These methods are fairly straightforward: update the score and the score label, and update the ship's health and the health label. //1 merely ensures that the ship's health doesn't go negative. Adjust the ship's health when it gets hit by an invader's bullet. If the ship's health is zero, remove the ship and the invader's bullet from the scene. If the ship's health is greater than zero, only remove the invader's bullet from the scene. Dim the ship's sprite slightly to indicate damage. When an invader is hit, add 100 points to the score. The above also explains why you store the ship's health as a value between 0 and 1, even though your health starts at 100. Since alpha values range from 0 to 1, you can use the ship's health value as the alpha value for for your ship to indicate progressive damage. That's pretty handy! 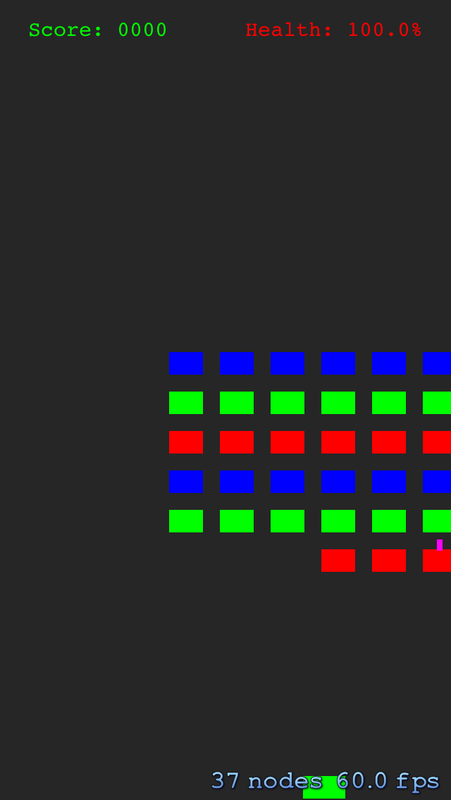 You've been incredibly patient working with these less-than-menacing red, green, blue and magenta rectangles. Keeping the visuals simple has worked well because it allowed you to focus ruthlessly on getting your game logic correct. Now you'll add some actual image sprites to make your game much more realistic — and more fun to play! 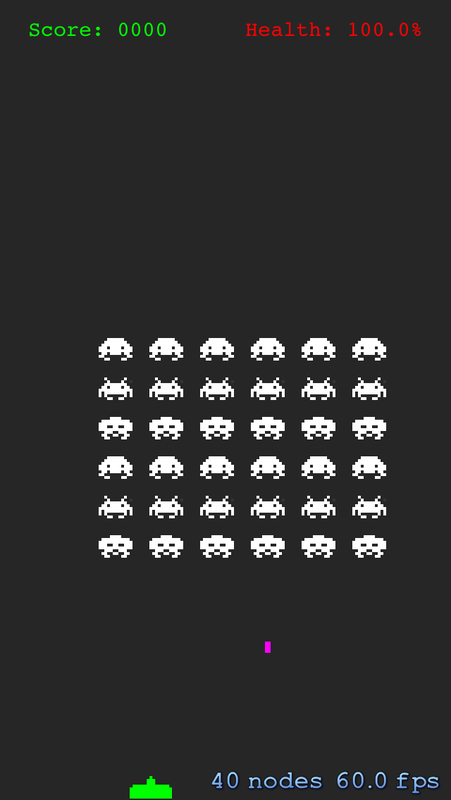 Loads a pair of sprite images — InvaderA_00.png and InvaderA_01.png — for each invader type and creates SKTexture objects from them. Uses the first such texture as the sprite's base image. Animates these two images in a continuous animation loop. All of the images were included in the starter project and iOS knows how to find and load them, so there's nothing left to do here. Looks pretty cool doesn't it? Next, you'll replace your blocky green ship with a much more retro and stylish looking version. Your ship sprite is now constructed from an image. Originally, the ship image is white, just like the invader images. 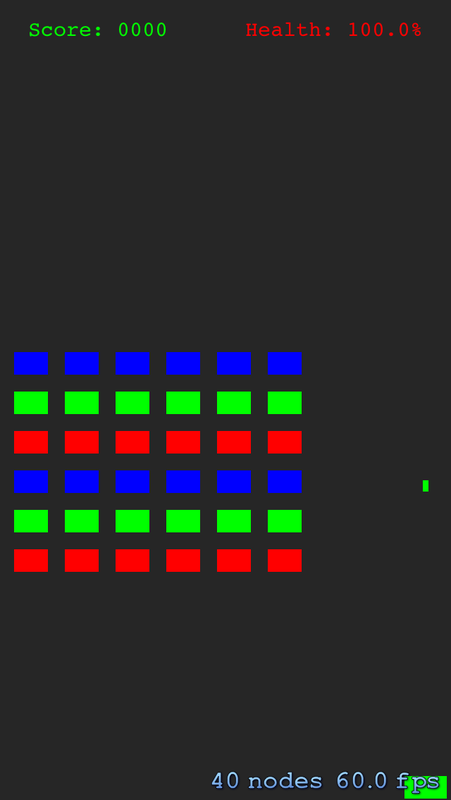 But the code sets the sprite color to make the image green. Effectively this blends the green color with the sprite image. Play your game for a while — what do you notice? Although you can blast happily away at the invaders, there's no clear victory or defeat. It's not much of a space war, is it? Think about how your game should end. What are the conditions that will lead to a game being over? Your ship's health drops to zero. You destroy all the invaders. The invaders get too close to Earth. You'll now add checks for each of the above conditions. The above defines the height at which the invaders are considered to have invaded Earth. The above imports the header for a scene named GameOverScene which is already present in the starter project. That sets everything up for the various game over scenarios. Get all invaders that remain in the scene. Iterate through the invaders to check if any invaders are too low. Get a pointer to your ship: if the ship's health drops to zero, then the player is considered dead and the player ship will be removed from the scene. In this case, you'd get a nil value indicating that there is no player ship. Return whether your game is over or not. If there are no more invaders, or an invader is too low, or your ship is destroyed, then the game is over. End your game only once. 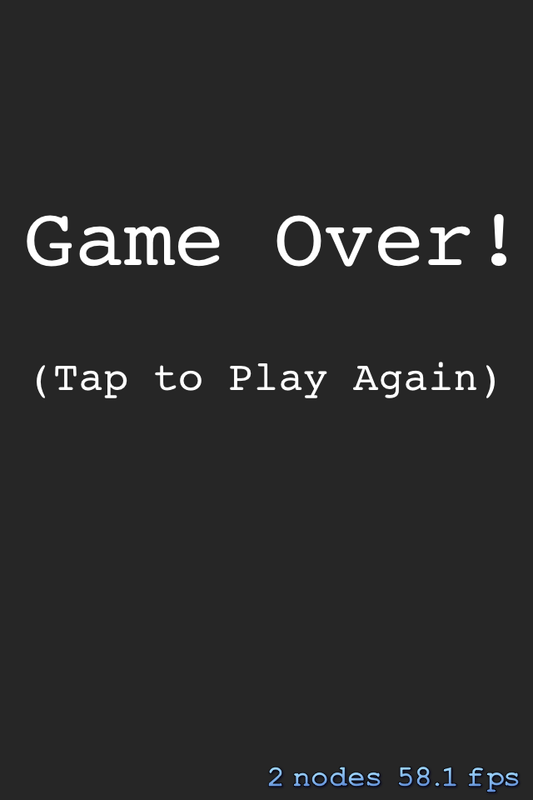 Otherwise, you'll try to display the game over scene multiple times and this would be a definite bug. Show the GameOverScene. You can inspect GameOverScene.m for the details, but it's a basic scene with a simple "Game Over" message. The scene will start another game if you tap on it. The above checks to see if the game is over every time the scene updates. If the game is over, then it displays the game over scene. 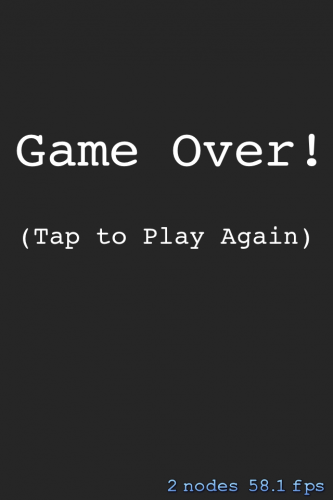 Tap the game over scene and you should be able to play again! It's a truism of game development that the last 20% of game development takes as long as the first 80%. When you're working on your next game, it's a good idea to start out iterating quickly with low-fidelity art assets (e.g. 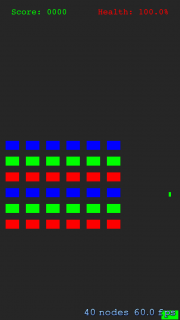 your colored squares) so you can quickly figure out if your game is fun to play. 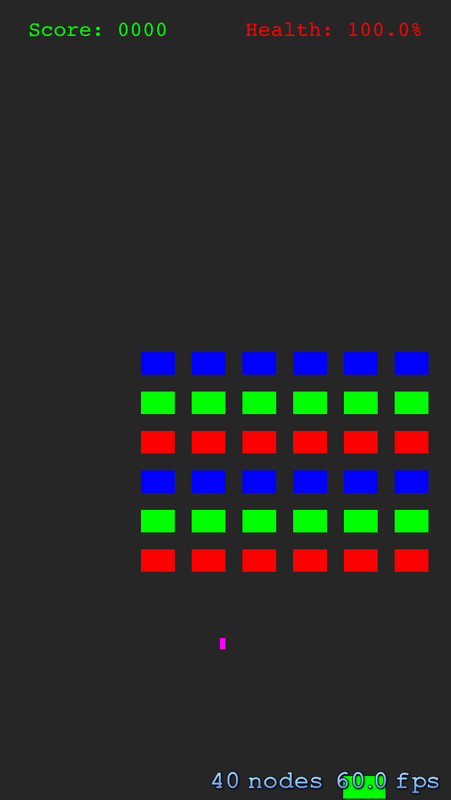 If it's not fun to play with colored squares, it's not going to be fun to play with fancy art work, either! Nail down your gameplay and game logic first, then build out with fancy art assets and cool sound effects. That being said, it's essential that you polish your game before releasing it to the App Store. 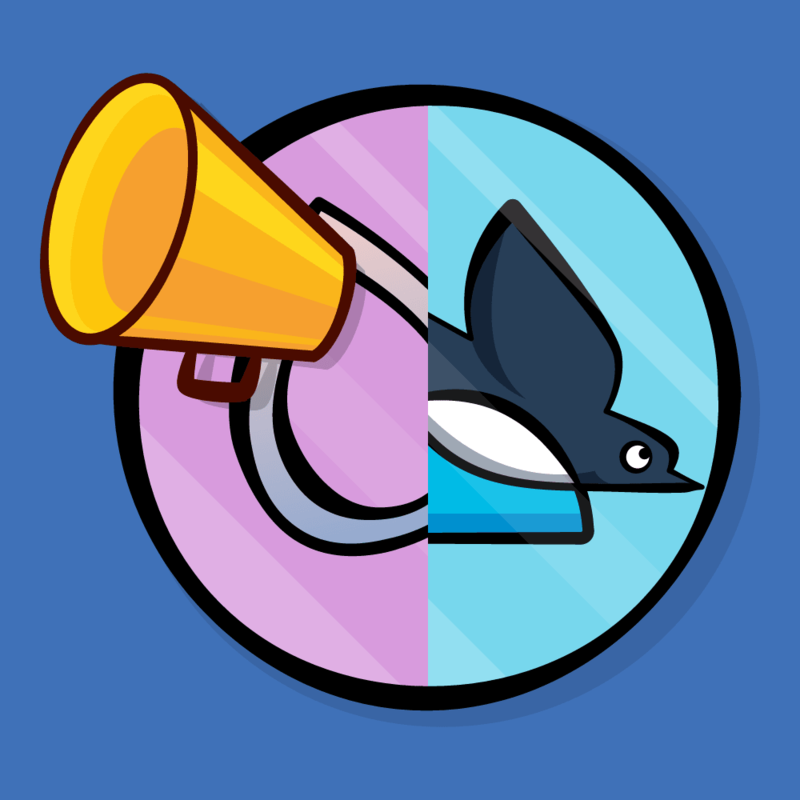 The App Store is a crowded market and spit and polish will distinguish your app from the competition. 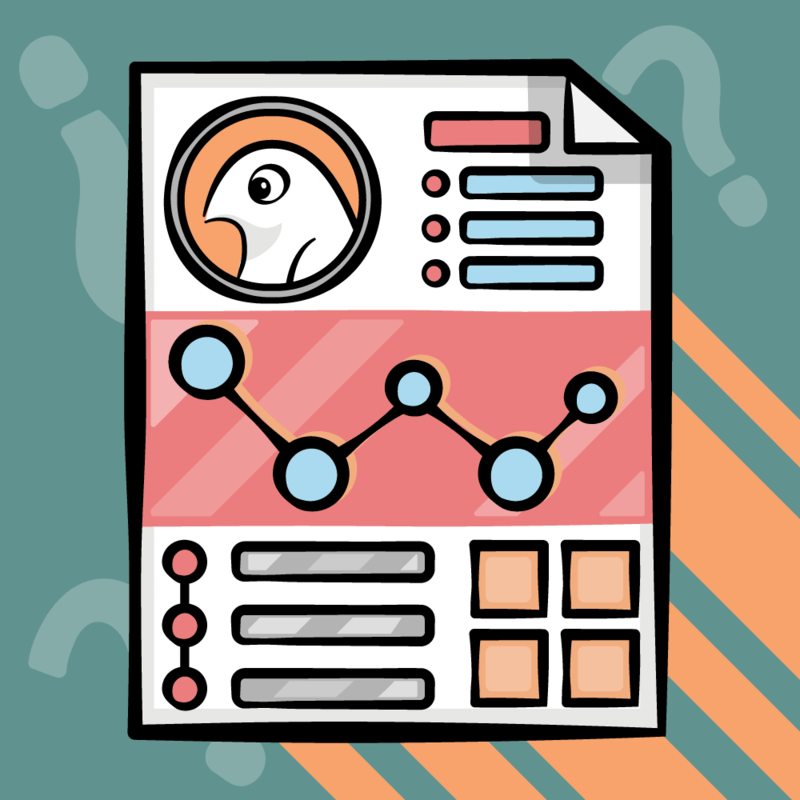 Try to add little animations, storylines and a dash of cute factor that will delight your users. Also, consider being true to the game if you're remaking a classic. 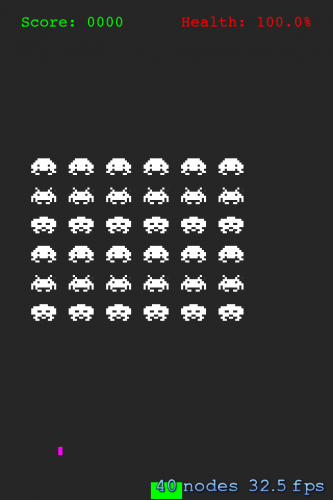 If you're a fan of Space Invaders, you'll know that your remake is missing one important element. 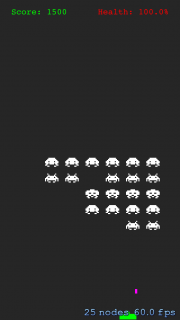 In the original game, the invaders march faster the closer they get to the bottom of the screen. This was an artifact of the early CPU used to run the first Space Invaders game - the game loop ran faster and faster with fewer invaders because there was less work to do with each loop cycle. The game's programmer, Tomohiro Nishikado, decided to leave this behavior in the game as a challenging game mechanic. You'll update your game to incorporate this game mechanic as well to please the retro gaming purists out there. Ignore bogus values — a value less than or equal to zero would mean infinitely fast or reverse movement, which doesn't make sense. Set the scene's timePerMove to the given value. This will speed up the movement of invaders within moveInvadersForUpdate:. Record the ratio of the change so you can adjust the node's speed accordingly. Speed up the animation of invaders so that the animation cycles through its two frames more quickly. The ratio ensures that if the new time per move is 1/3 the old time per move, the new animation speed is 3 times the old animation speed. Setting the node's speed ensures that all of the node's actions run more quickly, including the action that animates between sprite frames. Now, you need something to invoke this new method. The new code simply reduces the time per move by 20% each time the invaders move down. This increases their speed by 25% (4/5 the move time means 5/4 the move speed). This was a quick and easy code change that made your game that much more challenging and fun to play. If you're going to save the Earth from invading hordes, you might as well do it right! Spending time on seemingly minor tweaks like this is what makes the difference between a good game and a GREAT game. Here is the final example project from this Sprite Kit tutorial. I encourage you to experiment with your SKInvaders game. Play with it, tweak it and see what you can do! Breaking your code, fixing it, then finally seeing an awesome new feature come to life is one of the many thrills of game development. 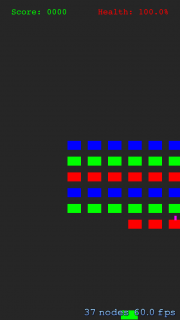 Hint: Add a property to GameOverScene that stores a message. Think about how to pass/set that property to the scene and how you would display it on-screen. Hint: Add another SKScene subclass (call it TitleScene) that is displayed first by your GameViewController. Tapping this scene should transition in your existing GameScene. Hint: Add a property to your GameScene to track hits vs misses: increment it for hits, reset to zero for misses. When the player gets three consecutive hits, show a special "STREAK!" animation and play a special sound. Hint: Take a look at handleContact: and think about how you could use a sequence of SKAction actions to animate the invader that was hit. How might this complicate your game state? Would you need to mark these invaders as "dead" so that they would no longer be considered for future contacts or scoring while they were doing their "death animation", but not yet removed from the scene? Hint: Add new constants for this invader's name and category. Use a pixel art tool such as Pixen to draw your own "Boss Invader". Make him mean! Think about where you need to add code to manage this new invader by looking at existing code that adds existing invaders and go from there. Hint: Think about where and when the GameScene was created and initialized. Hint: Currently, your game shows ship health. Instead, make the player lose a "life" each time their ship gets hit. End your game when they have no ships remaining. How will you show player lives on the screen? Hint: Use a new feature in iOS 7 that makes your iPhone utter any NSString that you give it. Hint: Keep track of player scores. Show players the high score list after each game. If you want to personalize your game further, allow them to enter their initials with each score. Do this locally without Game Center. Hint: In the original game, there were "defensive shields" above the player's ship that could absorb invader bullets. Each bullet that hit the shield would destroy part of the shield. As enough bullet hit a shield in the same area, channels would be carved through it that allowed bullets to pass through unhindered. The shields were evenly-spaced with gaps between them. The player could hide his or her ship underneath these shields. Through this tutorial series you learned some new tricks about Sprite Kit by building a very cool classic game along the way. If you want to learn how to build more fun games like this, check out our brand new book iOS Games by Tutorials, where you'll learn how to make five complete games from scratch! Enjoy playing your new game; I look forward to hearing from you with comments below or questions in the forums!